Nettle is a hardy perennial with a long history of use. The name "nettle" is derived from the Anglo Saxon word noedl, which means "needle". It grows in most temperate regions of the world, and has been used as a fiber for numerous purposes, as well as an herbal tonic with good nutritional value. 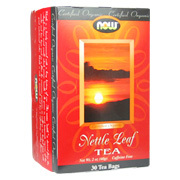 Nettle is rich in minerals and has a refreshing, earthy flavor. Free of: caffeine, artificial colors, flavors, preservatives or sugars. Other Ingredients: Organic Nettle (Urtica dioica) (leaf). Organic Nettle Leaf Tea is shipped in a discrete, unmarked package. Orders are processed immediately and usually take about 3 to 5 working days to be received. We do ask that you try it for 2 to 3 weeks to feel the full effects. Any information received is used only for order processing and shipping purposes. Your information, such as e-mail address, will never be disclosed to a third party.